Each Fall, I view design media and experiment @ AF to boost my skills and know-how. 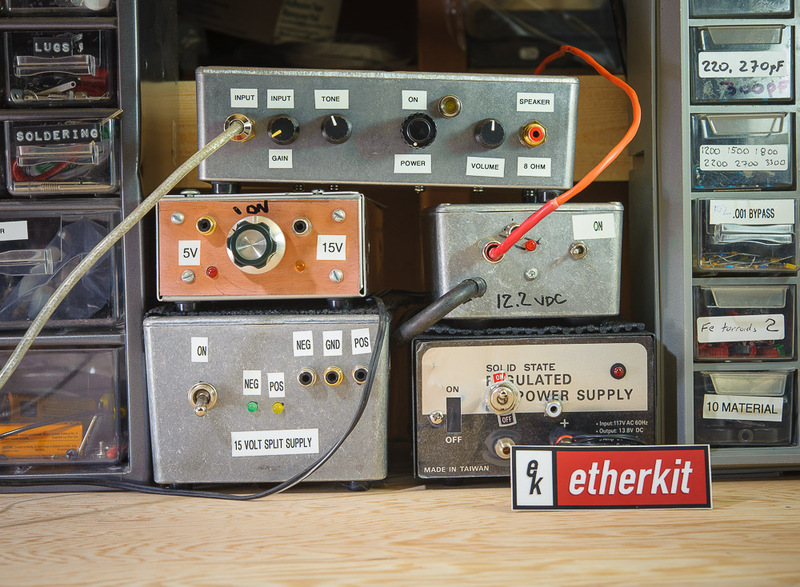 A bigger bench means room for more test equipment & accessories. Lately, I'm enjoying a bench activity maxima. In Part 1, I show a new line-in AF amplifier and in Part 2 some lessons learned about reducing noise and oscillations in home built AF circuitry. Hopefully, you find these installments useful. I make a lot of bench receivers and grew tired of repeatedly making new speaker-level AF amps. Now, on each receiver AF section, I'll just run a low-noise preamplifier, plus buffer stage(s) to raise the signal out of the noise and drive a low impedance output respectively. 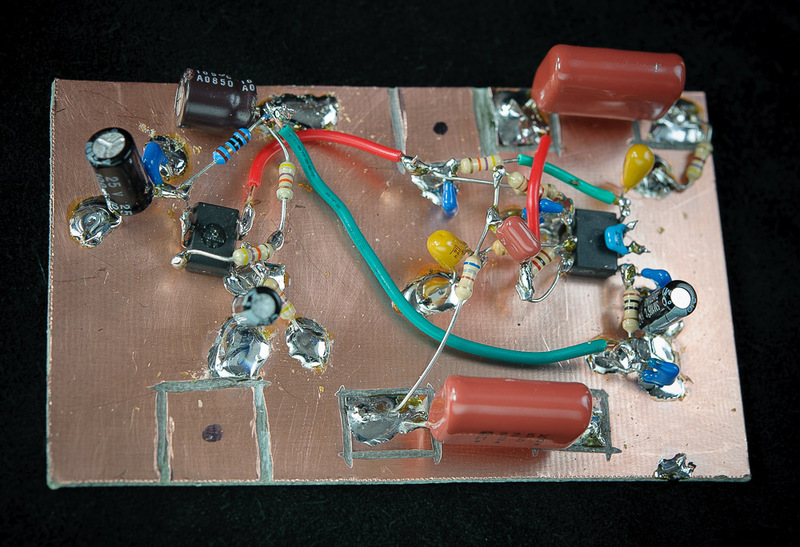 The in-situ buffer stage might also low-pass filter the signal before it leaves the receiver. A line-out RCA jack on the receiver chassis back will provide a connector for patching my receivers to this new AF amplifier box. Think modular approach. I sought a low distortion, low noise, high fidelity project. Above — Block out of the entire project along with the power gain of each stage. 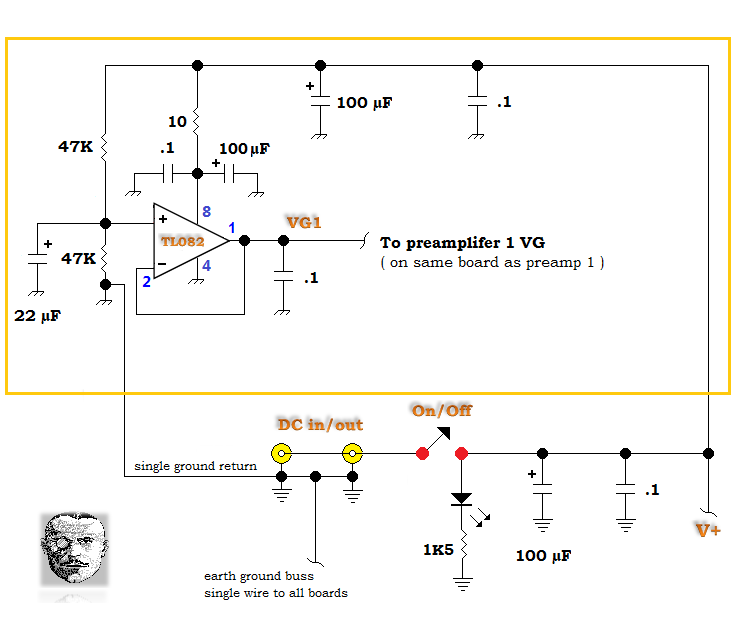 Above — The low impedance virtual ground (VG) source schematic and breadboard grounding system for this project. A carved square pathway lies around the 2 anchoring bolts for each of the 3 circuit boards so the bolts do not chassis ground these boards. 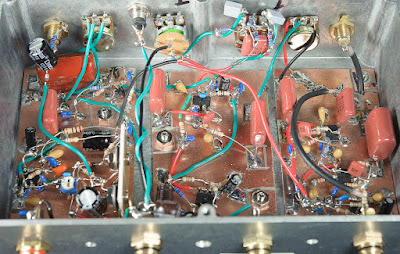 A single wire connects each copper ground plane to a common point [ earth ground ] on the 2 DC voltage input/output jacks: I call this star grounding and used this technique when building 5 - 50 W tube guitar amplifiers years ago. I didn't isolate the input and output RCA jacks, although was prepared to if hum arose. I won't go deeply into grounding since more informed people offer great content via an Internet search. The potential difference between 2 or more ground paths may induce a noise voltage source along those paths. When this happens, you'll hear a wretched buzz — 50 to 60 Hertz hum depending on which country you call home. Star grounding removes alternate ground paths and thus reduces the potential for hum. Still, others, isolate alternate ground paths with techniques including common mode chokes, isolation transformers and balanced circuitry. 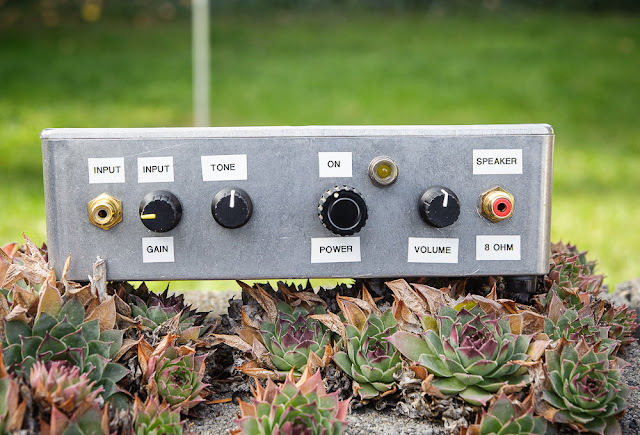 In typical homebrew receiver AF projects, ground loops don't pose the problem magnitude seen in larger AF projects such as a homebrew home audio system, or a tube guitar amp. From my experiments, the greater problem = low and high frequency parasitic oscillations. Delightfully, I hear and measure 0 hum in his project. On all 3 boards, rather than run the classic R1= R2 voltage divider, I opted to run a well bypassed, unity gain, op-amp voltage follower to generate the VG. The output impedance = near zero. This may represent overkill, however, as always, you're in charge. An EE who developed a neuromuscular illness and could no long build gave me a free box of new parts including TL082 op-amps, and they, along with 5532s donated by another reader cost me nothing. 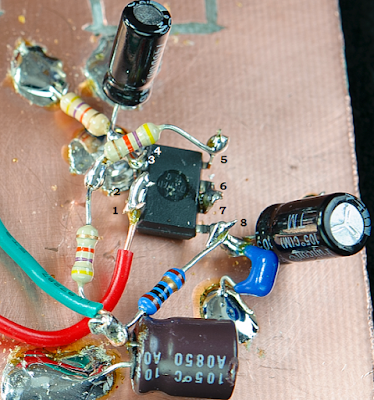 I applied 1/2 of the TL082 dual op-amp on both preamplifier boards for VG and left the other half unused. In general — in a large single-supply project, a variety of currents sum into VG and unless its impedance were practically 0, a changing voltage might arise which could lead to various unwanted feedback loops; both positive and negative. 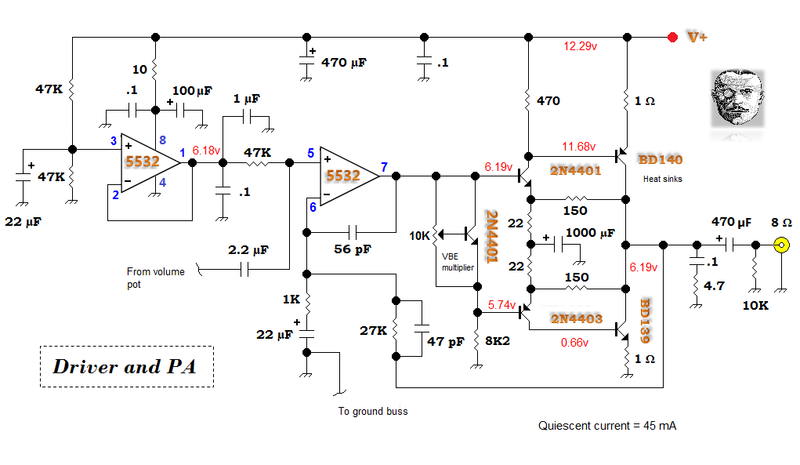 Fortunately, 0 impedance is fairly easy to obtain with an op-amp buffer due to its high open-loop gain at lower frequencies plus low capacitive reactance in the applied bypass capacitors at higher frequencies. 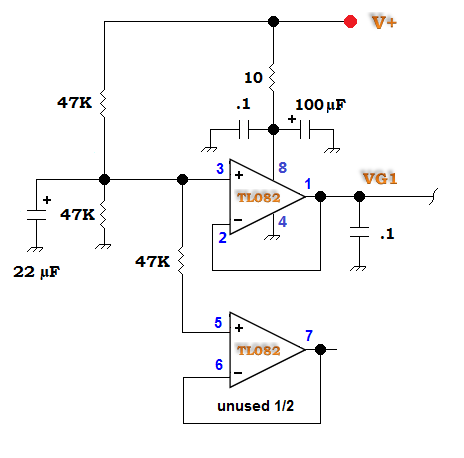 Above — The typical scheme to deal with unused op-amp halves. For some op-amps, floating inputs doesn't matter; however, in others such as CMOS types, problems may arise. So most people just connect the unused op-amp pins in a fashion like I've shown to remove any worries. Above — An Ugly breadboard under construction where only 1 half gets used. 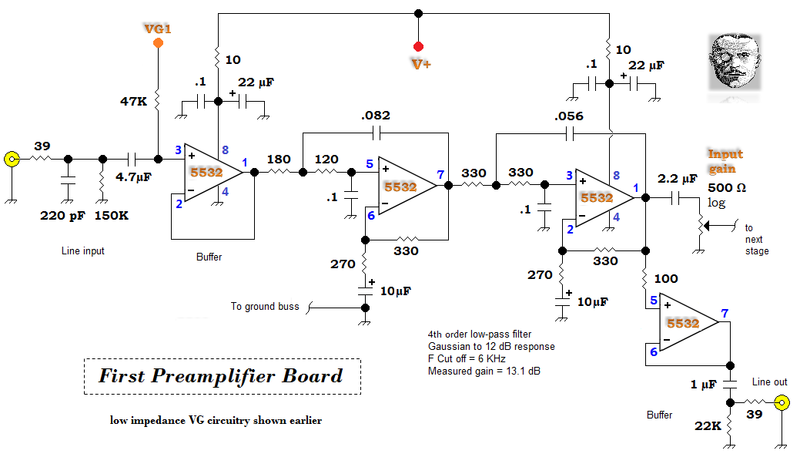 Above — Preamplifer board 1 schematic. The 39 Ω series resistor + 220 pF shunt capacitor form an RC network low-pass filter to bypass RF off of the signal path input where it might getting rectified and wreck things. My also RF bypassed signal source ( receiver ) line output impedance will = 39 to 50 Ω, so this RC filter's 3 dB cutoff frequency lies somewhere between 8 - 9 MHz which isn't very good, but so far it's working OK. I'll increase the capacitor value if needed. The die cast chassis helps the cause too. All op-amps V+ pins are 10 Ω resistor decoupled plus bypassed for both AF and HF per the 5532 datasheet. 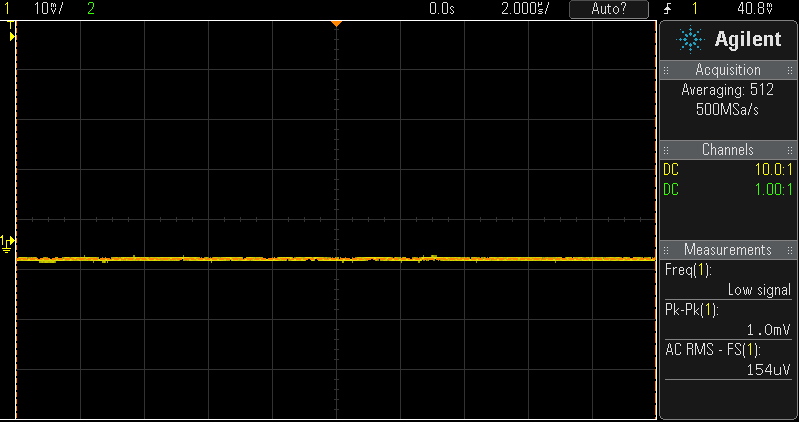 After the unity gain voltage follower buffer, a 13.1 dB power gain stage ( rolled out as a 4 pole, low Q, low-pass filter) gently scrubs off frequencies above 6 KHz. My listening tests over the past 2 years suggest this fCo works great for general AM, FM and CW listening. I think of it as subtle filtration of the receiver audio without rendering ringing, nor removing the sizzle. All the signal path resistor values in the preamplifier boards are low to reduce Johnson noise. The low value 270 Ω resistor AC coupled to ground in the low-pass stages might raise your eyebrows, however, measured versus calculated losses caused by the R is only 1-2 dB and I accounted for it when choosing the power gain. The output goes to a buffer with a "line-out" AC-coupled RCA jack along with a thud removing 22K shunt resistor — plus to a 500 Ω potentiometer for the main audio channel. I wanted the "line output" to view the signal coming out of the first preamplifer to help me determine if distortion occurs @ the input of preamplifier 2 with louder received signals. * Since I know preamplifier 1's gain, I can calculate the signal source output voltage without open a chassis lid. I'm not sure what AF signal source amplitude is ideal, and of course with the various receiver modes and RF signal levels seen this might vary widely. Thus, I placed an input gain control after preamplifer 1 to accommodate a wide variety of input signal strengths. The main point = if the signal is too strong I can reduce it to prevent clipping in subsequent stages. Over time, I'll figure out what works best in this application. * Note: I don't employ AGC nor headphones in my home station receivers. 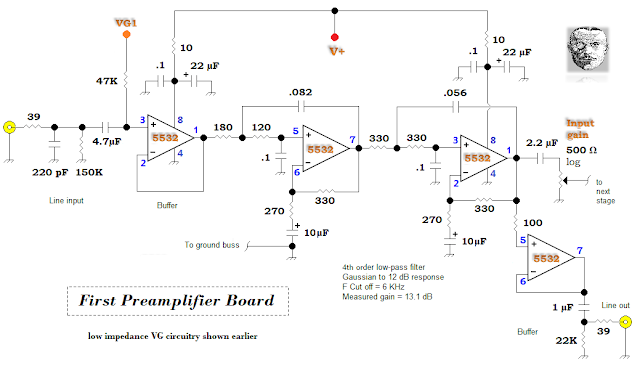 Above — Preamplifer board 2 schematic. 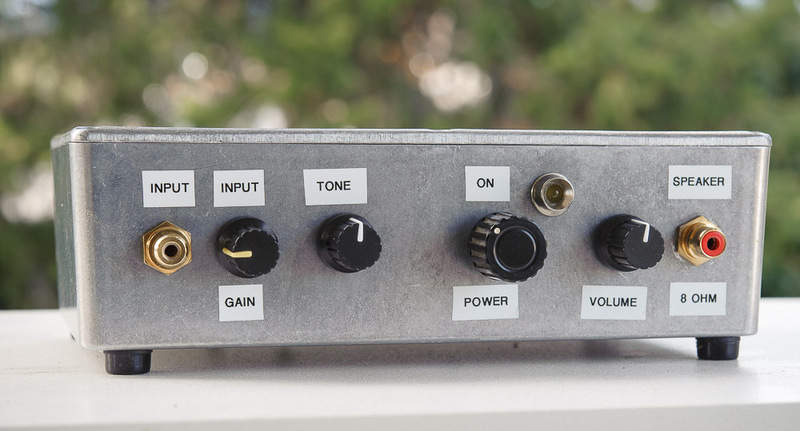 A 2 pole 6 KHz cut-off low-pass filter boosts the signal 12.6 dB and drives the single knob tone circuit. 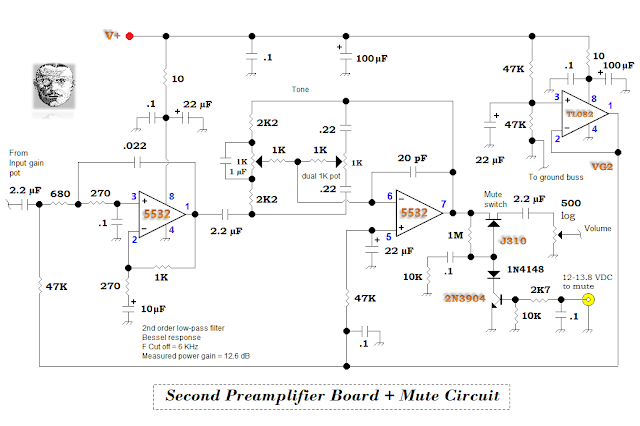 Adapted from Douglas Self [ Reference 1 ] this amazing circuit delivers quite an impact: relatively low noise compared to some tone stacks, plus low distortion. I'll cover the 20 pF feedback capacitor in the tone control op-amp in Part 2. I love a tone circuit in my receiver audio chain. Most receivers lack a tone control circuit. Not knowing the listening environment, nor speaker we'll listen to, we must chose fixed coupling capacitors in our receiver AF chains — and hope for the best. Sometimes, we'll choose small value coupling caps like 0.1 µF and get tin cup audio. Conversely, muffled speaker audio may come with too large a coupling capacitor value(s). A tone circuit allows you to compensate to maintain fidelity and also personalizes the listener experience a little. 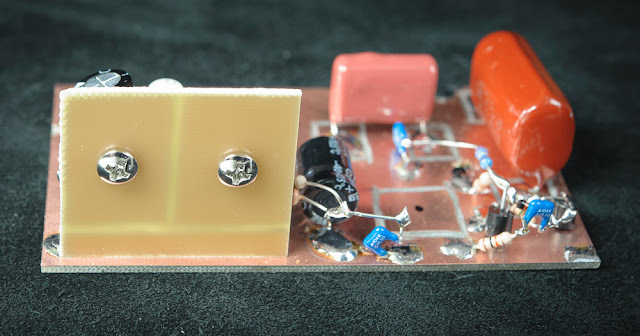 A simple, low noise FET switch grounds the tone op-amp output for use with a transceiver. Not shown in a schematic but seen in photos — the DC mains on - off switch is a 1K pot with a integral switch. I may implement a side tone circuit + volume control at some point and placed this part to allow easier future modifications. 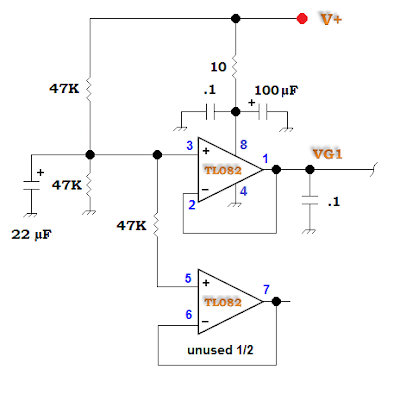 Above —An FFT of the tone circuit when pushed into subtle clipping @ 8.81 Vpp. At 8.64 Vpp, no harmonics were seen ( just the DSO noise floor ). I've never viewed a single 12 VDC supply tone control circuit deliver such headroom before on my bench. Great design by D. Self ! Above — The preamplifer number 2 breadboard. For space reasons, I placed the FET switch on the AF power amplifier board ( board number 3 ). The 2 squared off islands got drilled when this board was bolted in. All my 2.2 - 4.7 µF polyester caps are rated @ 400-600 V ( a bargain bin purchase from long ago ) so they take up lots of space. I've further refined this design to remove some noise and boost stability. To set the bias of the Class AB pair in my PA designs, I first connect a 1 KHz oscillator to the input and terminate the output in an 8 Ω resistive load. A DMM set in ammeter mode inserted between the power supply and positive rail monitors DC current to help prevent excessive current draw situations such as a breadboard mistake. The signal generator input signal is initially set to 0 via it's amplitude control pot. I initially set the entire stage quiescent current to 25-30 mA by adjusting the VBE multiplier "amplified diode" 10K trimmer pot. Then the signal generator pot is adjusted to until about 5 Vpp appears in the DSO. The VBE trimmer pot is tweaked to just eliminate crossover distortion in the time domain sine wave. 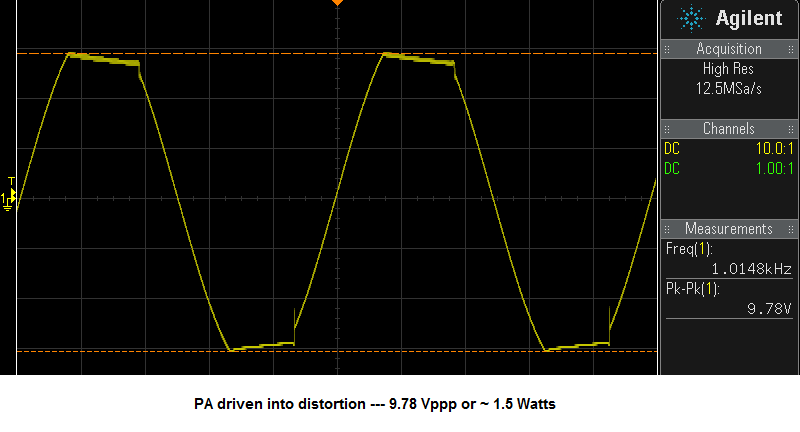 While slowing increasing the signal generator amplitude I then find the maximum clean average power and ensure that crossover distortion doesn't re-emerge with more drive. 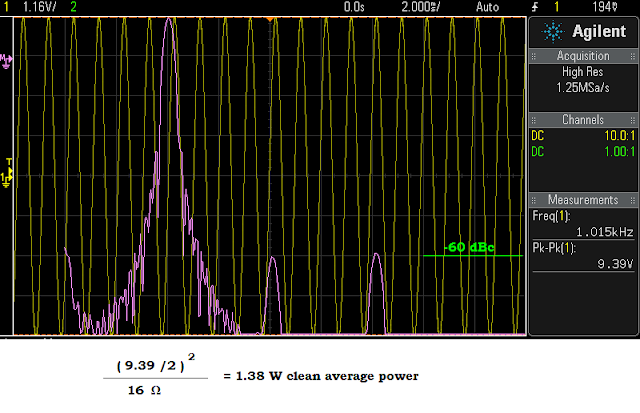 Maximum clean Vpp measures show between 9 and 10 Vpp for this PA.
After setting the bias and determining maximum clean power, reduce the signal generator amplitude to 0 and view the current meter. This is the entire stage quiescent current and typically runs 20-50 mA for my PA. I then remove the ammeter, repeat the whole process without the DMM 2 or 3 times. Finally when satisfied all is OK, the quiescent current gets re-measured and recorded. 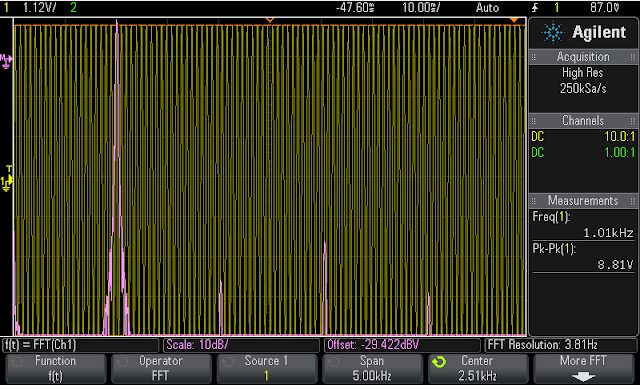 I set the bias in my homebrew audio PAs by viewing in time domain for decades — until a fine DSO landed on my bench. As mentioned in previous posts — if you've got a DSO with a good FFT math function, another way to set the bias = tweaking the VBE multiplier pot while watching the distortion in your FFT sweep. That's what I do. My DSO features 12 bit sampling in high resolution mode. In this particular amp, I set the bias pot for the lowest distortion performance, turned off the signal generator and then measured the entire stage quiescent current @ 45 mA. Above — PA bias time domain screen shot. 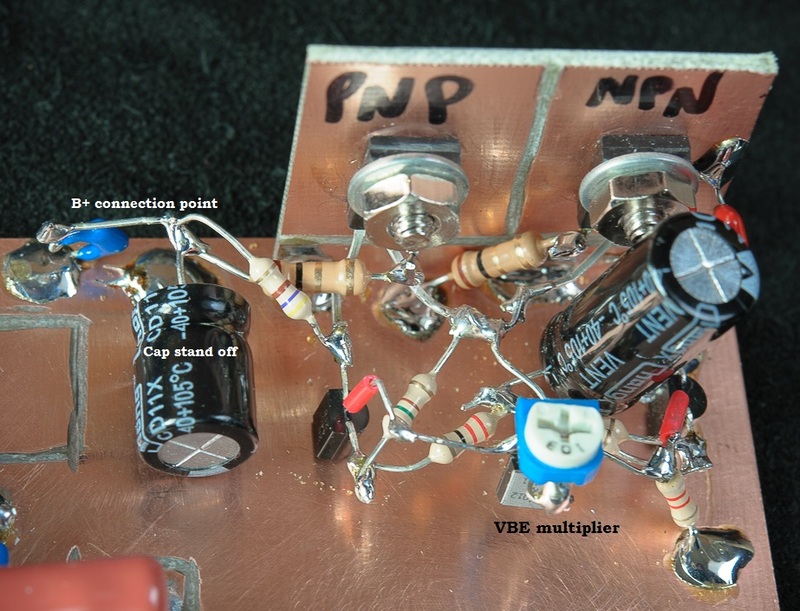 I advanced the VBE pot just a fraction to eliminate this crossover distortion. Then I added in FFT to really nail the bias setting by repeatedly taking it just in — and then just out of crossover distortion to find the sweet spot with the lowest measured distortion. Above — PA driven by signal generator to 1.49W: some clipping emerges and notice it's happily ~symmetrical on both halves as the signal swings nicely 'tween the rails. Above — PA breadboard on circuit board number 3. I'm increasingly using AF + RF capacitors as stand-offs in my Classic Ugly Construction. I didn't need to separate the PNP from the NPN transistor as shown above in the Cu board heat sink, since, in my design, they 're connected anyways. A carved cut separates the heat sink collector connection nodes from the copper ground plane board. Above — PA breadboard alternate view. Right after, I added the op-amp circuitry and fired it up. 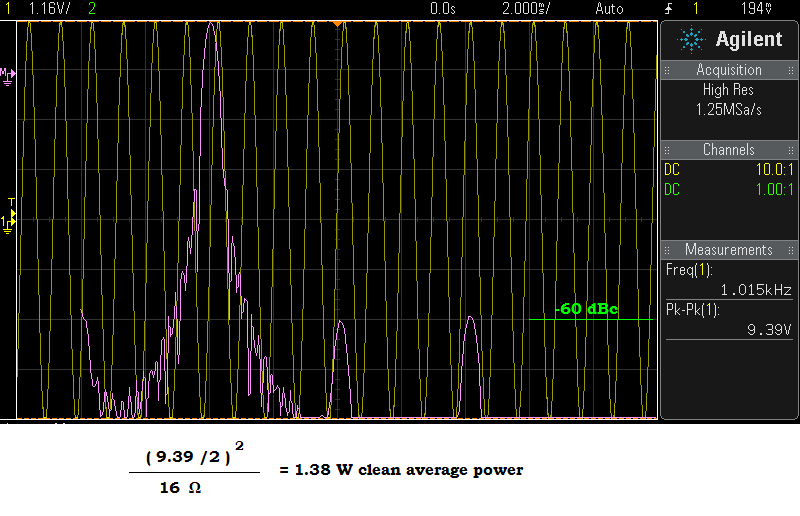 Above — FFT showing my "clean" average power = 1.38 W. My personal definition of clean average power is where all harmonics are very close to 60 dB down. Use your own definition please. 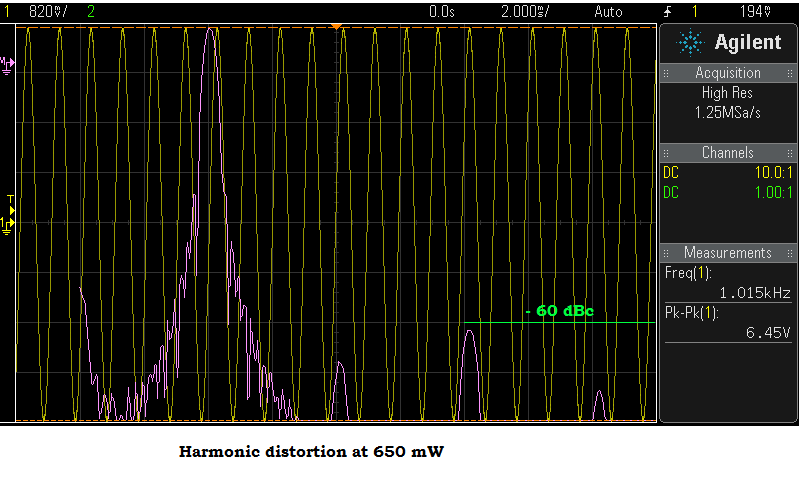 Above — FFT showing the harmonics where Vpp = 6.45. 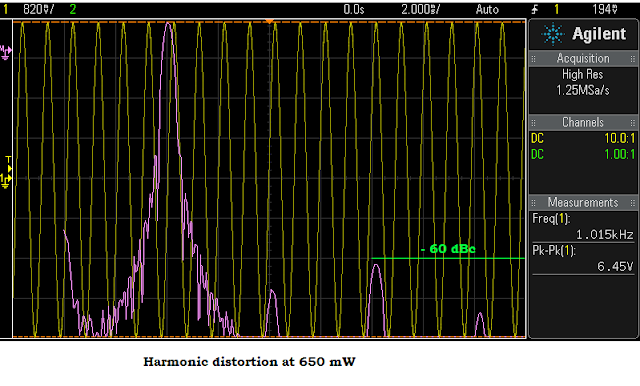 In a quiet room, 650 mW is loud to my ears. I don't use AGC when receiving at home and prefer no clipping on strong signal peaks so low distortion = desirable in my world. Headroom happiness. Above — An averaged measure of noise across a 8 Ω resistive load with no input signal and the input port terminated with a shunt 470 Ω resistor. No oscillations and low noise voltage make me happy. 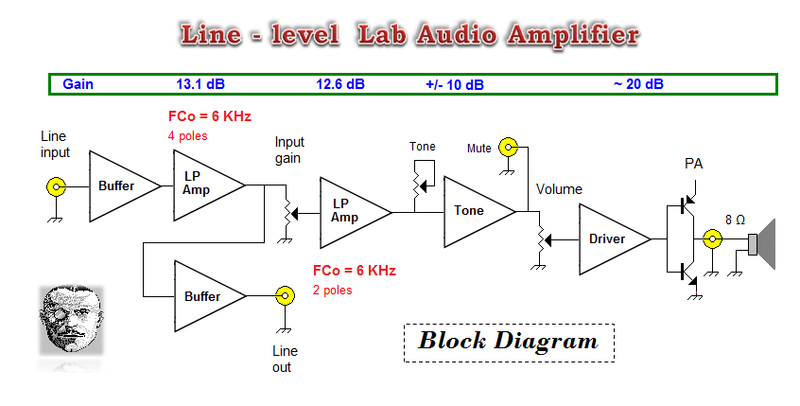 For a good amplifier, the noise level (over the audio bandwidth) should be at least 80 dB below the maximum output power — preferably it should be >= 90 dB. For 1.38 watts and 8 ohms, that's 3.3 Vrms. 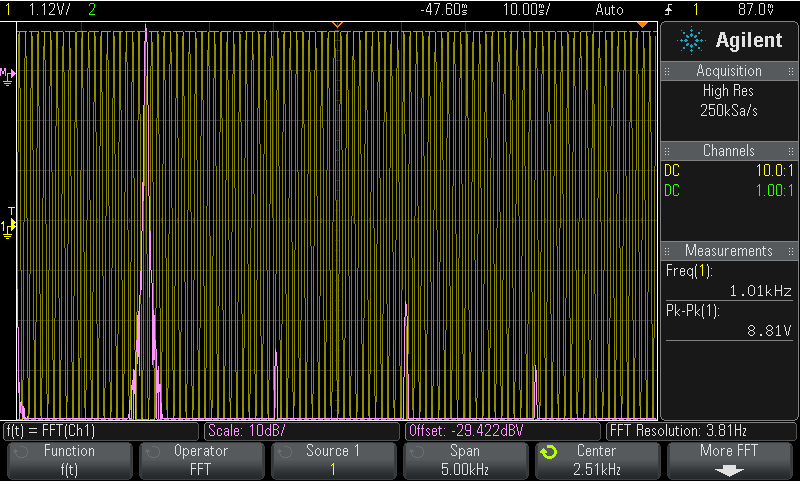 The noise (bandwidth limited to audio) should then be less than 330 µVrms; or about 2 mVpp maximum. You can see I made it. 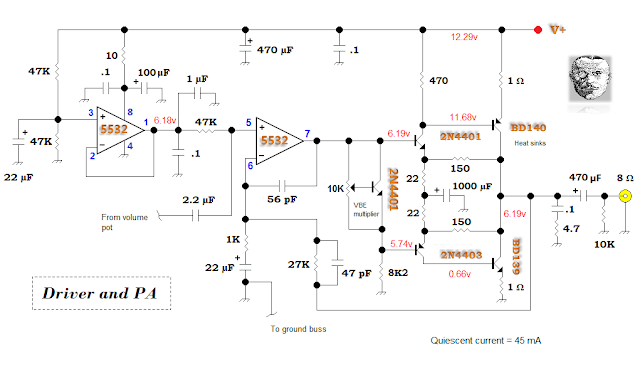 I'll go into debugging in Part 2, but the key for a very low output noise voltage in my particular amp = the 56 pF feedback cap from the op-amp output to input + the 47 pF cap across the 27 K feedback resistor that limit the PA stage's upper bandwidth. In the highest spirit of the grunt bench experimenter, I tried various cap values and recorded the noise voltage results. The capacitor value across the 27K feedback R was crucial. I had to keep it low. In this amp topology, even a 270 pF capacitor in that slot could trigger intense HF oscillations. More later. I prefer measures, but noticed a correlation: good measures often leads to good sound in AF design work. Easily the best AF I've built, this box lacks noise plus distortion and sounds wonderful — Hi Fi bench amplifier goal accomplished. Above — The old lab AF amp dwarfed by the new version. You can find it in the old site archive. 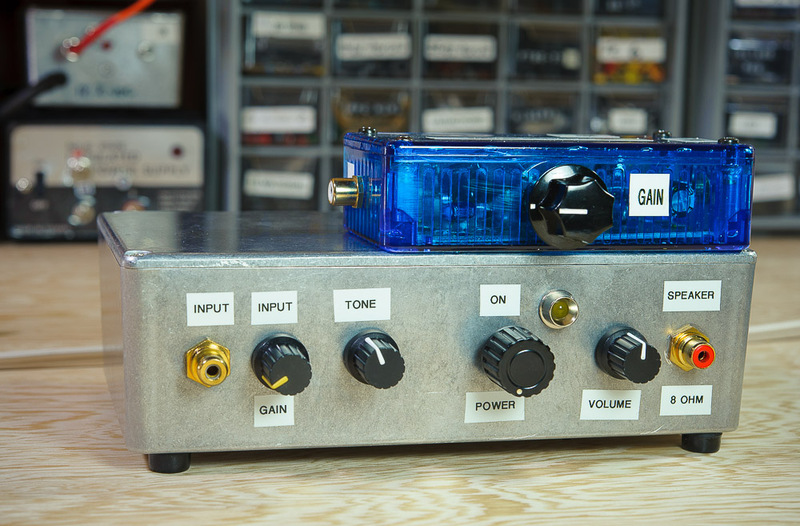 I used this old blue box for speaker AF listening tests of the preamplifier 1 and 2 breadboards. Above — The AF amp lying on top of my 4 linear bench power supplies. 3 are home brew. I modified the commercial product (bottom right) to improve its performance — I use it in QRP-level transmitter design because of a big transformer that makes it a stout voltage source. I'm not the only fan of my big new bench. Small Signal Audio Design: 2nd edition by Douglas Self. I briefly review this amazing book and stellar author on my Funster Part 2 blog post. 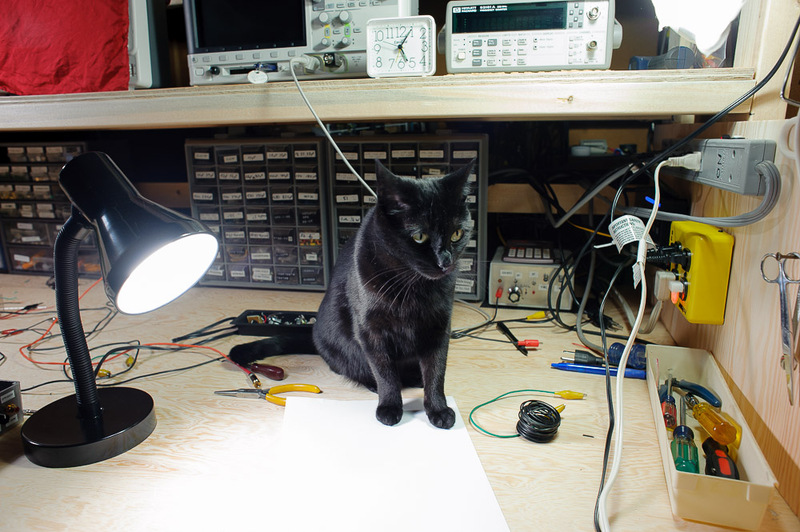 I'm not 1 for hyperbole, but a low noise signal generator, a 'scope and Douglas Self's book are all you really need to design good AF circuitry on your bench. Professor Kenneth Kuhn: This page and also as a mentor of bench excellence. EMRFD published by the ARRL: In EMRFD, Rick, KK7B inspired me to passionately pursue AF design. Thanks to Wes and he. Elliott Sound Products - Rod Elliot's pages = essential reading for AF designers. Wonderful work! Would it be useful to add a rectified audio out with a time constant of a second or two for making measurements/comparisons? Thanks Jim. I like your comment and agree -- some DC would prove quite useful. Apart from monitoring, I just thought about a chassis-mounted LED to show clipping. Lots to ponder. Best! Vasily, I like your module approach with your AF amp. I've been meaning to take a modular approach with my projects. I think the AF amp is a good place to start. 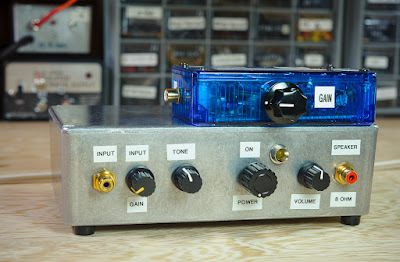 Where did you obtain your enclosure for your AF amp? Solid, RF tight --- plus you can drive a truck over them. Hammond makes them here in Canada, but sadly they're costly $$. I re-purposed that particular enclosure and originally got it along with a ton of others at an estate sale. Классно ты делаешь свою работу.Очень интересует твое мнение насчет приемника Уивера. Извини,что не на английском и надеюсь ты на русском читаешь. Привет, Александр. Спасибо за все, что я хорошо читал русский язык. Уивер радио очень круто и другой Eay, чтобы "сделать это"
I'm working towards building my first receiver for picking up WWV and I'd like to use this externally as a lab amplifier of sorts. Are some of your resisters 1/2 watt? I'm putting together my parts bin and needing to order some stuff, including the large film capacitors.